Αφιέρωμα στη σύγχρονη ελληνική ποίηση, από το αμερικάνικο περιοδικό "Drunken Boat". 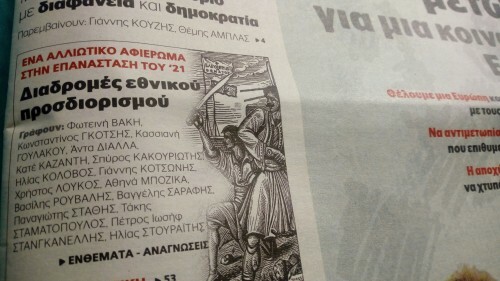 Σε επιμέλεια του Βασίλη Μανουσάκη, μ' επιλογή ποιημάτων και ποιητών για την ανθολόγηση στο τρέχον τεύχος. When I was first asked to do this tribute to modern Greek poetry in translation, I was faced with an important dilemma and I found myself wondering: Do I go for the safe choice of the generation of the 70s and their important works or do I choose to represent my generation of poets, the younger poets who have a significant poetic sample to show and have already made their mark on Greek poetry in one way or another? As you will see by the selection of poets who follow this introduction, I opted for the second, because I believe it is important to show the world that Greek poetry still breathes and produces poets amidst the economic crisis that hit Greek society so hard. But what is it that you are about to read? 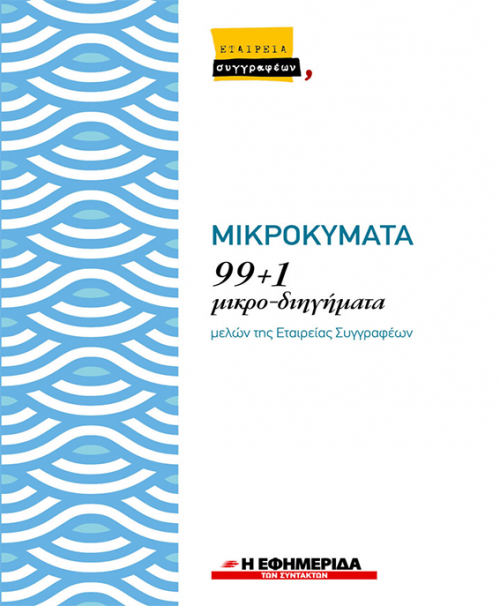 What is Greek poetry nowadays? To answer that I would borrow terms from quantum mechanics, namely the Schrodinger's cat experiment, and say that: Greek poetry holds a grasp on the important paths of the past – as those were carved by the Nobel Prize winners Elytis, Seferis, the mighty Alexadrine Cavafy, the national poet of Greece Solomos and so many others, modern and older – and doesn't. Takes us back to the lyric verses of Sappho, and doesn't. Incorporates the age long tradition of ancient Greek poetry, and doesn't. And finally, maintains the characteristics of Homer's epics, and doesn't. 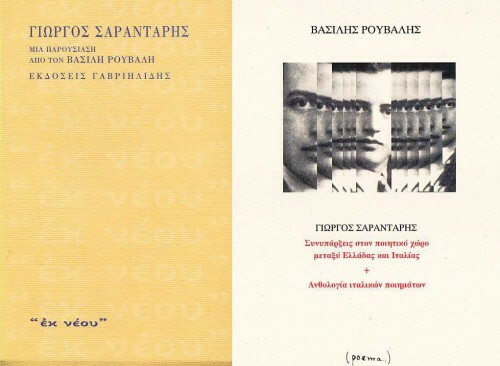 As readers realize, there are so many influences on Greek poetry that it would be hard for any poet to break free from the poetic tradition primarily, and from the parallelisms of what s/he writes to what has already been written before, secondarily. And yet, it is this “doesn't”, the second part of Schrodinger's equation, that I am mainly interested in here, in this selection. And having this in mind, I set myself certain criteria for the inclusion of the poets you are about to read. The first thing I looked for was originality or as Harold Bloom in his influential book The Anxiety of Influence defines it: the point of divergence from the father or mother (poet), the point where these poets found a voice and/or style, be it through a deliberate misreading of the forebears or even a complete rejection of the parent poet. The second criterion was the content and its freshness, because I find it of utmost importance that a poem should captivate its audience by appealing to both reason and emotion and by making its readers identify with or think about the poem after the initial reading, to say the least. And the final criterion was the poems' translatability, that is, the extent to which the poems selected would be read as original poems in the target language (English in our case). Since most of the translations would be done by myself, I definitely had to take this criterion into consideration in order to give the anglophone readers the chance to get acquainted with the Greek poets that live and write today and their way of thinking and expressing themselves. In my opinion, all poems are perfect examples of the modern trends in Greek poetry. Different poets, different perception of the world, different ways of expression, different backgrounds; same means of expression, same cultural background, same language tools. And the result is tremendous and it was indeed a great pleasure for me to meet, read and, through translation, delve into the poetry of these 14 poets. And what follows is only a very brief glimpse of what each poet chooses to represent through his/her poetry and how s/he perceives the world, but the real justice will be done to them not through my words, but through their own words themselves you are about to enjoy in this Drunken Boat issue. Hence, I will let them introduce themselves to you through the poems selected here, but before you start reading, I have to state that I was very privileged to be chosen as the bearer of Greek poetry in the 21st century. And I am grateful for that to the Drunken Boat editors and to the poets, who trusted me with their poetry, as well.